The residents of Királyszentistván are collecting signatures as a protest against the construction of the crematory. According to the plans of the company who has already obtained the permissions, the construction will take place on the outskirts of the village, next to the playground and a rest area. There is a playground and a rest area with an empty plot in the neighborhood. At least for now. According to the plans, there will be a crematory soon. – We have collected 293 signatures and I think there are 346 eligible voters. They have got enough facilities lately that they didn’t even want – they say. – We have enough of these edificies; if we look around, we can see an incinerator within 2 kilometers and there is the county’s waste treatment facility within a 1 kilometer circle. Many people do not understand why should Veszprém County’s first crematory be built on a historical village? However, the investing company has already received effective permissions. – It would be the disgrace of the country if a construction like this took place on the scene of the battle between István and Koppány. There are family houses near the area. A resident claims he has a direct view of the site from the bedroom window. – When mothers come with their children,they will see the same thing that I see every day. – he said. According to the head of the investing company, there is nothing to be afraid of. The building will look like a family house. – There is no smoke emission or pollution. The have lifted borders on an embankment and it will be surrounded by plants that are impossible to see through – said the executive director of the company. The executive director also said that the residents do not even know what they were protesting against. The truth is that nobody has informed them about the details. RTL Klub news, 13 September, 2011. I am listening to the news on TV and I am either nodding in agreement, or feel surprised and amazed. To be honest, who would want a crematory to be built under their window? Or an incinerator in the close neighborhood? No one, probably. And who would like to live in a body which once will become a disgusting, stinky garbage rejected by the of István’s and Koppány’s battle? Who would want the children to cry out when they learn the truth – even if there is no pollution? Who would want his body which he admires day by day in front of the mirror to be categorized one day as “hazardous waste”? Who would want to be hidden behind a lifted embankment and plants away the eyes of those who will end up there as well – but until then they protest and turn away? No one, probably. But the future waste also has pride and self-esteem. And fear. Fear from becoming waste, from the identifiable future, from becoming part of the inevitable heap. You should not have any doubts; everyone will end up there, everyone will become waste; it’s just the question of time and system. What bothers me the most in this story though is, that one day I will also become “hazardous garbage”, with no place to be stored at, whose handling and storage is a problem that needs to be solved. I try to find the exact spot or rather a line on my body after which I become waste. It cannot be simply the fact that my pulse stops and the body starts to rot. Although the future residents around the crematory will see me as disgusting waste, there would be a few living soul for whom this body would not be just some garbage to get rid of. They would even see something in this dead stuff and they will weave it through and through with emotion. But where is the limit? In case the village votes unanimously for bringing the waste elsewhere, can the opinion of some people be stronger? Could the opinion stating that the disgusting waste is respectful and has to be protected convince the crowd? Can the scene of the battle of István king and Koppány accept me? I tried to find the answer with two experiments. The first was to follow and adore an originally waste object from its birth. Perhaps an action like this could give the answer on how and when something becomes waste, how do I become waste.I found a milk box the most suitable product for this purpose. After drinking up the milk from the box, the remaining milk becomes more and more disgusting, not desirable in my environment. Evidently, it was not possible to be with it from its birth but it was possible to adopt it at its developed stage. I went to Spar and chose the milk box which would stay with me from that time. I did not want to follow the daily shopping procedure; going to the fridge and taking the first box. I stood there and examined the boxes. As I looked over them, they looked all the same; red spots on white boxes, plastic cap on the top. I was looking on them but none of them looked different from the others. To tell you the truth I did not want anything different, a misprinted or a deformed box. I did not want to choose a box only because it was different and I did not want to choose based on regret. I did not want to be bound to it because of its difference or specialty. Moreover, I did not want the most bulging and most perfect box as my companion. But I had to choose somehow. I closed my eyes, touched the air at 20 cm above the boxes and I listened to my inner voice in order to decide when to stop and put my hands in the fridge. I did 2-3 circles and slowed down my hand like the fortune wheel in the television and took out a milk box. I held it in my hands and I felt its coldness and its bulging liquid and I really felt that this was different from the others. It was more beautiful. The red was redder, the patterns were more vivid and the whole was more manufactured than the others. I was satisfied and happy. I put it in the basket and paid for it at the cashier. I also bought some other things: cheese, salami (of the brand “Pick” because I like it) and a beer. I took the things home and put them in the fridge – except for the milk. I put the milk on the table and I stared at it. I read everything written on it: 2,8 fat content, producer, ESL technology, I have to consume it within 3 days and I have to store it between 0 and 6 Celsius. Alright, but these details refer to the milk and not to the box which I was more interested in. 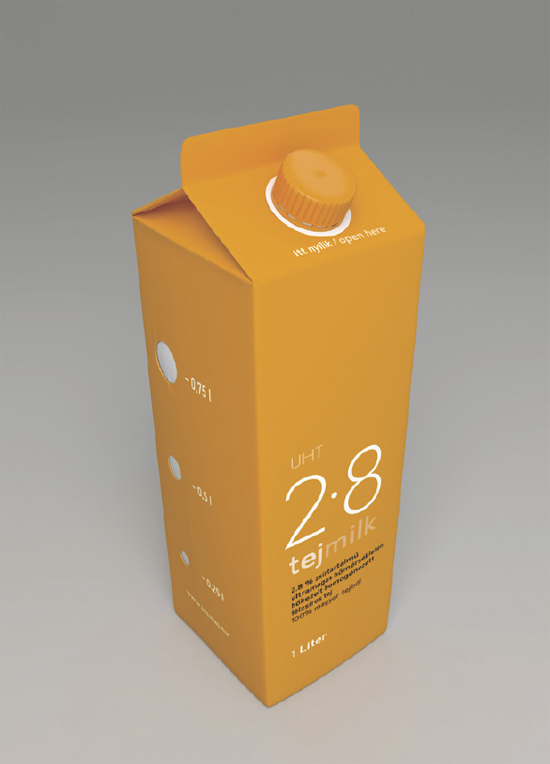 All I learned about it was the fact that it was produced by Tetra Pak. But I felt that the inside is also important, I have to get acquainted with it. Anyway, the box does not make any sense without the milk in it. If the milk goes bad or its nutritional value is added to my system, the box is done. At the very moment it becomes waste. It loses its function. Its inner content is lost and consumed. So the inner content is important. I must like the milk in order to be able to like the box. Therefore I got to like them together. I drank a glass of milk every morning – paying attention to the “best before” date – and I enjoyed each drop to the full – just the way I followed every motion of the box. When I poured the milk out, I smoothly unscrewed the top, observing the perfection of the top and the thread of the cylinder, the feeling, the proportions and the patterns of the box. Then I read the instructions and put the box back in the fridge. I took the box out more than once a day even when I did not drink from it. At these times I put it next to the computer – but not for a long time, so the milk would not go bad. Then I read out the news about the Swiss franc currencies and Való Világ reality show. I could not read out longer articles, because we did not have so much time; the milk warmed up quickly. As time passed, its content decreased rapidly. Then I poured out less and less milk. The last days were over the “best before” date, first it became sweet than sour, finally I had diarrhea and the box got empty. I could not accept the fact that it was over. I was attached to the box and I sticked to the thought that the milk box made sense without the milk. First I had an idea that I would fill the box up with newly-bought milk and I would drink the milk only from this box, because this was the best milk box that had ever found me. But I felt that it would not be fair to fill it up with others’ content. I tried to pour water in it but it was not drinkable even after rinsing the box out. I thought I would use it as a vase – the carnation looked weird in it. I put pencil in it but as I did not want to cut its top off, it was useless; the pencils fell in it and it was hard to pull them back; moreover, I use pencils very rarely. So I put the empty box back in the fridge after I had read out the news from Index according to which the government reduces the number of university students and Brad Pitt is shooting a movie in Kőbánya. I realized that I had to let it go, the experiment was close to final; the question whether it was waste or not, was about to get an answer. Next Wednesday I put the box in a bag and took it to the editorial staff meeting where I met people close to me. At one point I took the box out and showed to the others what a beautiful milk box I had. They did not understand the situation. They said that this was totally the same as any other milk box. They said it was empty and stinky and they thought that I was kidding. I took it home and I could not sleep that night. The garbagemen arrive at our house between 6 and 6:30 every Thursday. I wound up the clock. But it was not necessary, I was awake and waiting. I dressed up and went down to the trash. I did not want to say goodbye so I opened the trash and put the box on the top of the garbage. Then I took it back and waited for the garbagemen holding the box in my hand. They said they would take the municipal waste to the rubbish dump of South Pest and asked if I wanted to throw the box in with the rest at last. I opened Google Maps and checked the directions to the rubbish dump. I felt it fair to take the box to the dump myself. After a long journey, I arrived to the front desk, where the man thought I was an idiot, when he saw me holding 500 forints in my hand and asking for decent treatment for the milk box. I rather brought it back home and put it next to my university notes in the basement. After a few weeks I summarized the result of the experiment: nobody is born waste. Everything has a purpose until it is important for someone. Then I started the next experiment. Now a living material- which is not waste originally – has to be made waste. The most suitable subject for this purpose was me. For this purpose it was necessary to give up every affection, love and attention towards the people around me. I had to commit a ritual inner suicide. I must put an end to love and friendship. And I also must forget everybody. Here I am now. Lately my phone has not rung and I have not received any email. I do not have the strength to go down to the Spar.